BOISE, Idaho, Sept. 10, 2018—The political action committee of Idaho’s leading small-business association today announced its endorsement of Brad Little for governor. “The choice is simple, Brad Little has a proven track record as a strong supporter of small business and a proponent of smaller government and limited regulation,” said Suzanne Budge, NFIB’s Idaho state director, speaking for the NFIB Idaho PAC, which made the endorsement. 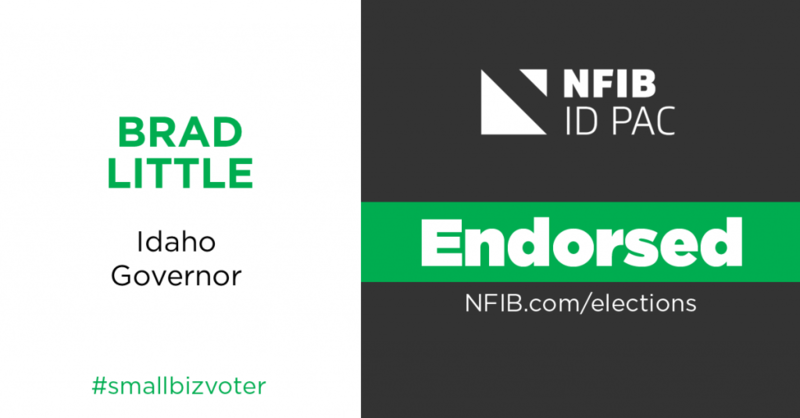 In a ballot of NFIB Idaho members, 73 percent supporting endorsing a candidate for governor and of those, 87 percent supported endorsing Little. Both gubernatorial candidates also received the NFIB questionnaire. Little responded, Jordan did not. This news release can also be found on the NFIB Idaho webpage. Follow NFIB Idaho on Twitter @NFIB_NV.